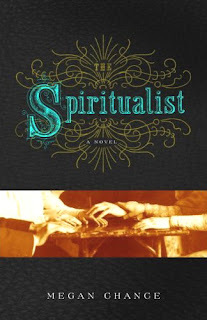 Megan Chance delves into the world of mediums into her newest novel, The Spiritualist. When Evelyn, the daughter of an investigator weds Peter Atherton, she marries up into posh 19th century New York’s “upper ten” - the top families of the city. Her struggles to fit society’s expectations of a successful lawyer's wife are made more difficult by her husband’s reluctance to treat their marriage as anything more than a comfortable arrangement; in fact, his proposal is phrased as “doing him a favor.” Despite the strain, Evelyn attempts to embrace Peter’s world, including his arrogant family and his apparent interest in spiritualism. She attends a spirit circle led by Michel Jourdain and quickly judges him a charlatan bent on duping her husband and the society widow, Dorothy Bennett. But Evelyn is forced into a deeper understanding of Michel’s world when Peter is later found murdered and she stands accused of the act. Peter’s family and friends ruthlessly turn against her, all except for Mrs. Bennett and Peter’s law partner Benjamin Rampling. He boldly steps in to help clear Evelyn’s name. But almost everyone in Evelyn’s acquaintance is hiding secrets from the past that hold the key to her future. She must rely on help from unexpected sources to avoid the hangman’s noose. The Spiritualist is an engaging story, with memorable characters; each fleshed out in full to give the reader a great perspective. Michel Jourdain is striking yet reveals unexpected facets of his personality. Peter Atherton is tragic and tortured, yet he shows a surprising inner strength. Evelyn, who struggles so hard to become what she is not, learns that her destiny is in her own hands. Ms. Chance effortlessly portrays New York society at its worst and best of the period and makes it easy for the reader to dive into that world. There’s a temptation to race to the ending of the story but the journey with the characters holds the reader’s interest. With unexpected twists and a startling conclusion, Ms. Chance has written a beautiful novel. I highly recommend it.